As the city's primary sewage treatment facility, this plant treats an average of 40 to 45 million gallons a day. At peak, the volume can exceed 80 million gallons a day, as the plant operates 24 hours a day, seven days a week. In addition to Alexandria, the plant also serves Fairfax County. The operation uses about 500,000 pounds of pelletized lime per month for pH control. 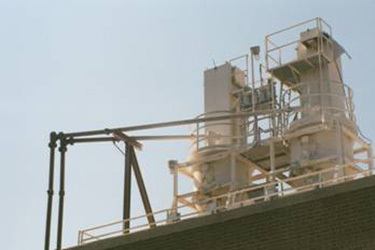 This powdery mix is pneumatically conveyed from trucks to 70' silos through twin four-inch lines. Initially fitted with 4-inch sweep elbows, the lime conveying system started experiencing leaks in the sweeps after about six months of operation. The sweep elbows were swapped for sweeps fitted with wear-backs. Those lasted a bit longer. "Then we were probably losing an elbow every nine months," according to Bob Devereaux, Lead Mechanic. The dust was a problem — and so was the downtime. Plant Process Manager, Tom Tyler, sent Devereaux a postcard featuring a different kind of elbow offering a free trial. He checked out the web site and then contacted HammerTek for the name of a local representative. In April 1998, Alexandria Sanitation Authority began replacing sweeps in the lime lines with 4 in. HammerLoy™ Smart Elbow® Deflection Elbows. 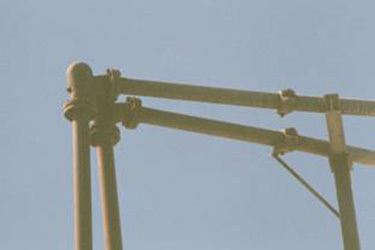 By June 2000, there were five Smart Elbow models in service. According to Devereaux, two years later they pulled a couple Smart Elbow units out of the line and inspected them for wear — and there wasn't any they could see. Since 1998, the HammerTek Smart Elbow models have steadily replaced sweeps and consistently resisted any hint of wear. According to Devereaux, the switch to the Smart Elbow products has more than paid for itself. In fact, 14 more Smart Elbow units have been specified for a plant expansion planned for later in the year 2000. The Smart Elbow design relies on deflection, not impact, to change flow direction, thereby eliminating the impact-related problems associated with virtually every other conveying elbow design. At system start-up, a gently rotating ball of suspended material forms in the vortex chamber of the Smart Elbow Deflection Elbow. As the main flow of material passes this ball, it is "deflected" through the desired change of direction without impact, friction or wear to the elbow's interior surfaces. HammerTek Smart Elbow Deflection Elbows can save your company time, expense and reduce regulatory paperwork by not failing in the first place. Truly an intelligent "ounce-of-prevention" for conveying systems where any incidents of sweep elbow failure has environmentally sensitive consequences. Fact: The Smart Elbow design provides maximum environmental protection by eliminating elbow wear due to abrasive impact and friction.